This 4 bedroom villa with private pool is located in Quinta da Balaia and sleeps 8 people. It has WiFi. The villa is near a beach. Holiday property consisting of 2 separate houses, 8 people, 6 room/s, 4 bedroom/s, 4 bathroom/s, approximately 160 m², 1 floor/s, year of construction 1999, renovated 2009.
none. Linen/towels available. Change of bed linen/​towels 1 x included for stays of 10 days and more. Deposit € 300 (in cash). Pet not allowed. Situation: holiday village Quinta da Balaia. Access/parking: parking on the estate; parking on the road near the house. Estate (private use): approximately 1000 m², closed plot (entrance gate), flagged floor. Pool (shared use): O 20.0 m, open throughout the entire season, children's pool. Sports facilities/ leisure time: shared use (payment): tennis. Plot description: terrace (partially roofed), further terrace (partially roofed), roof terrace 100 m², furnishing provided, 6 sun loungers, sunshades, brick barbecue. Private pool: Private pool: 6.5 x 4.0 m, 1.00 - 2.00 m deep, open throughout the entire season, pool maintenance 1 time(s) per week. The agent describes this villa as an ideal holiday rental for the summer holidays. For younger guests there is some vibrant nightlife not too far away. It is also good value for money. 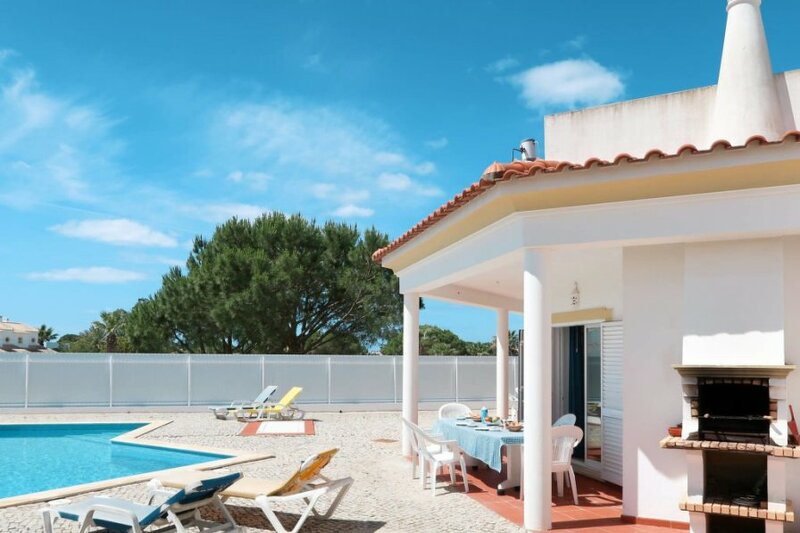 The villa has a private pool and is located in Quinta da Balaia. The nearest airport is 256km away. It is set in a convenient location, 2.3km away from a beach and 4km away from the city center. The villa has free wireless internet. The villa is adequately equipped: it has a dishwasher and a washing machine. It also has a BBQ and a tennis court.